Important notice: Our videos are meant for existing EMDR therapists to use. They are not a replacement for professional treatment nor do they serve as a ‘do-it-yourself’ EMDR process. EMDRgateway will do all it reasonably can to ensure access to these videos is restricted to EMDR therapists who have at least level 1 training approved by one or more of the UK & Ireland EMDR Association, the EMDR International Association, the EMDR Europe Association, the EMDR Institute or EMDRIA. Case of woman with history of childhood physical and emotional abuse. 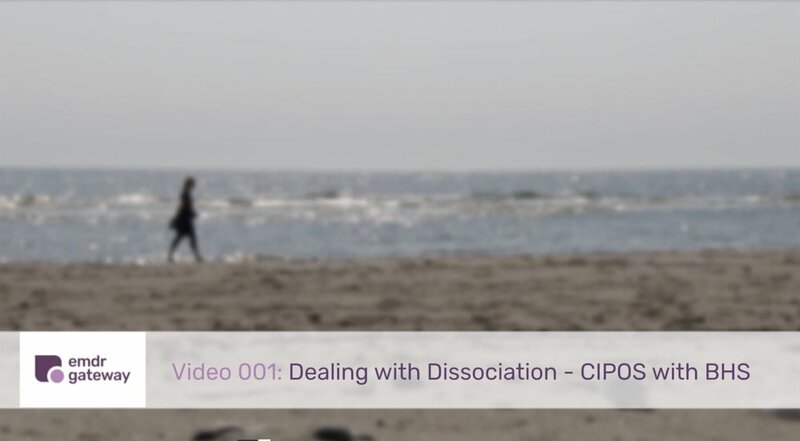 Video shows how to work safely when there is a high risk of dissociation, which can lead a client to lose contact with the present moment and be caught up in the past when asked to describe or focus on a traumatic event. The client may become dys-regulated and re-traumatised. In desensitisation, dual attention – one foot in the present and one in the past - may be lost and the process could stall. Case of woman with history of childhood physical and emotional abuse. Video shows a Phase 3 Assessment with a dissociative client, stabilised with CIPOS and BHS, when the trauma is held by a part of the personality. Both the adult part (called the Apparently Normal Part or ANP) and the child part (called the Emotional Part or EP) contribute to the assessment. Following this, it shows how to start the Phase 4 Desensitisation. In both situations the therapist is shown initiating communication between parts. Case of woman with history of childhood physical and emotional abuse. When different parts of the personality co-exist, hostility may also be present. The adult ANP, for example, may not be prepared to ‘accept’ an abused child part (the EP), so that internal conflict will continue to dysregulate the client. The video shows how to work towards reconciliation between these parts. Case of a man injured in an RTA in which his partner died. Sometimes the client is so affected by trauma that they try their best to avoid thinking about what happened to them. This is a natural defence, designed to protect the individual by minimising or excluding from awareness a disturbing memory, or a shocking realisation, or a part of the personality that holds the trauma. When this happens processing will be stalled. The video shows how this defence can be overcome so processing can proceed. Case is of a woman in an on/off relationship with a jealous and violent man, who still had ‘feelings’ for him. Video shows how to overcome a situation where a client has ambiguous feelings about the issue so that their negative experience is minimised by idealisation of the perpetrator. This can prevent desensitisation and resolution of trauma with EMDR. Case is of a woman groomed by a colleague. 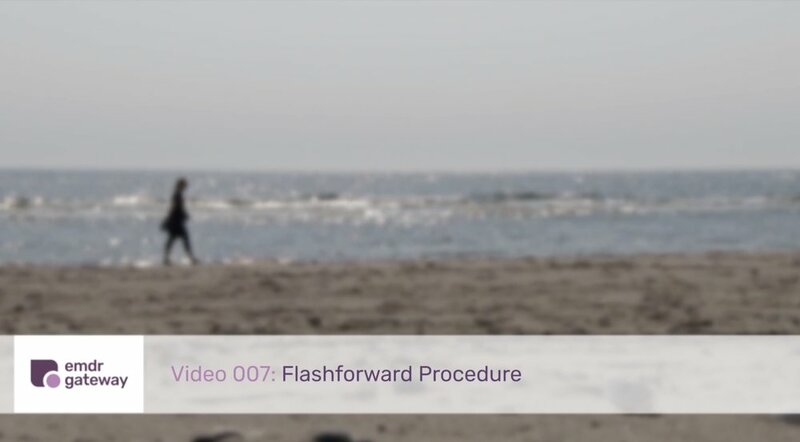 Video shows how to use Flash, a fairly simple and brief technique during the preparation phase of EMDR to facilitate processing of intense, traumatic memories that clients might otherwise find too difficult to access. Clients in this category may dissociate and become emotionally overwhelmed or shut down. This may make use of the standard protocol potentially dangerous or impossible. This video demonstrates one way of doing flash, but there are other ways. It is said to be effective with 80% of clients. Case is of a woman who had an on/off relationship with a jealous and violent man. Though past traumas have been successfully resolved, she has catastrophic fear of a future event - that he will return and kill her. Video provides an understanding of where this fits into the standard three pronged approach in EMDR therapy: first, dealing with the past; second, dealing with present; third, dealing with future concerns. This video demonstrates the Flash forward process in dealing with an irrational future fear in the present. The key difference between and Flash forward and Future templates is that the former is about resolving anticipatory anxiety in the present, i.e. in the second prong. Future templates, on the other hand, are about building skills to meet future challenges and are regarded as being part of the third prong. Case of a man injured in an RTA in which his partner died. The trauma has been treated successfully, but he returns to therapy because a Court case is coming up and he will be a key witness. Video demonstrates how to work with a client in order to design an optimal response to present and future challenges, taking account of their own beliefs and what is feasible. It then shows how to install this – the future template – with bilateral stimulation. Case of a woman bullied at work and with a history of physical and emotional violence by her father. The therapist started with the childhood experiences and during processing of the worst of these, the client became blocked – no longer able to ‘see’ what happened next – and the processing stopped. The video shows several ways of getting over this problem where the nature of the block is clear. Case of a child – Grace/Seren - injured in a horse riding accident. Shows the use of the Four Field Technique that asks the client to make use of drawings - a safe place, initial target and what subsequently arises during the Bilateral Stimulation phase. Aide mémoire describes option for installing a positive cognition for children who are mature enough to handle this phase. The case is about a six year old boy called Oscar. Oscar’s come to therapy because he’s afraid of visiting doctors following a traumatic experience - hospital doctors had to manipulate his elbow back into place without the use of pain killers. The video shows how the Absorption Technique can be used to promote resilience and develop coping mechanisms so that Oscar can go forward with less fear and a more balanced view of doctors. This is a true story about a woman called Helen. The video describes her history - one of childhood sexual, emotional, physical abuse and neglect, and includes an interview in which she tells of her experience with EMDR therapy. In the third part of the video, her therapist describes the process from his perspective, including the various protocols and interventions used.